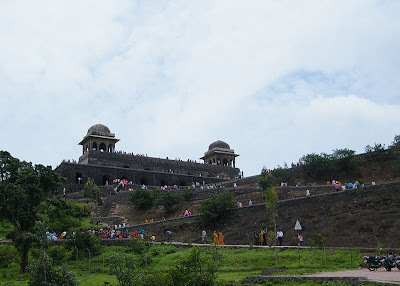 Mandu is the small town of Madhya Pradesh also known as Mandavgad. The town is located at Dhar's district of Malwa region. The only distance of 35 kms between Dhar and Mandu allow visitors to reach the spot with no worries. 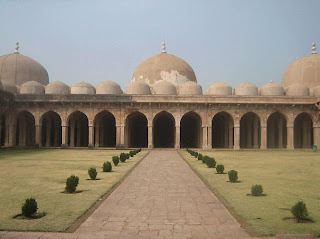 Mandu is the Indian tourist place known for royal Mughal's achievements. This place was under Taranga kingdom in 11th century. The best thing to watch in Mandu is fine architecture. Few famous Sanskrit inscriptions are having the information related to Mandu town. 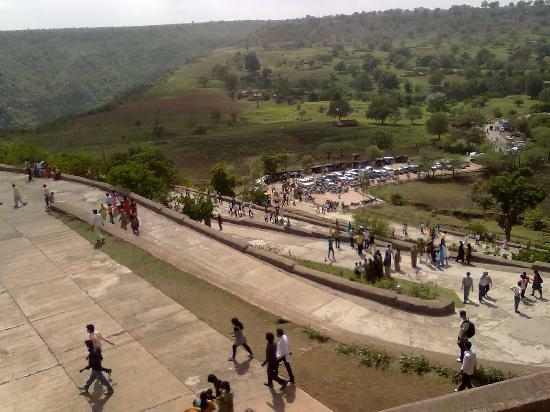 This hill town got more popularity in 10th and 11th century when Parmars captured the town. Parmars rulers recognized the city as Mandavgarh. However, Khiljis got the control of the town in 1305. As per experts, the meaning of Mandu is the city of happiness. This name was given by the rulers came after Allauddin Khilji. 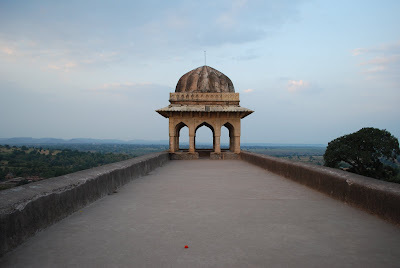 Mandu is positioned at the height of 633 meters expended in 13 kms area. 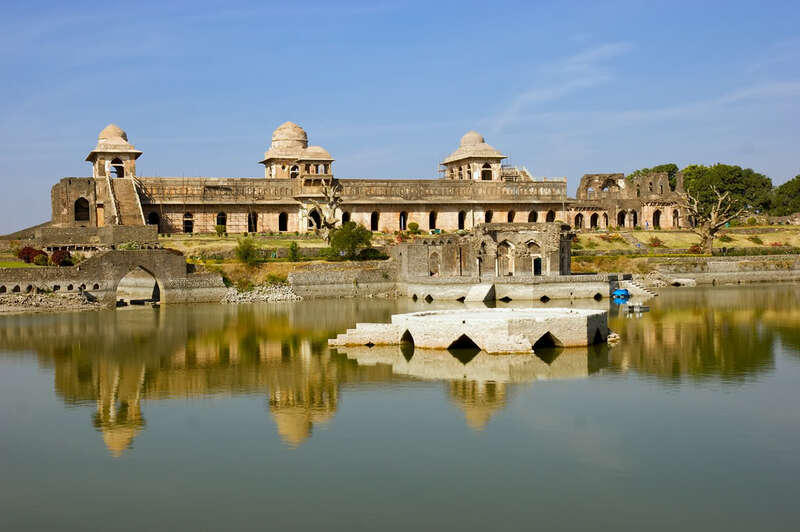 The Vindhya Range at the north and greenery of the valley along with Narmada River in the south is special things to watch in Mandu. Raja Bhoj the famous ruler of India found the city in 10th century. However, the city was occupied in 1304 by the Muslim rulers of old Delhi. Different rulers came to Mandu and did some developments of the city. However, this Indian tourist place is famous for architecture work only. Mandu played the vital role for mugal and many other kingdoms. Lots of rulers came and established their dynasty at this town. Buland Darwazas (Huge Gates): to enter the city tourist has to cross around 12 huge gates of the city. These gates were completed covered during the different kingdoms. Jahaz Mahal (Ship Palace): this Mahal is located between two non-natural lakes. The 2 story structure of wonder is special thing to watch in Ship Palace. 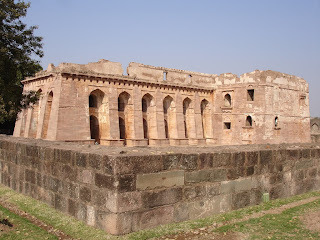 Because of its appearance, experts gave the name as Jahaz Mahal. It was constructed by Khilji ruler Sultan Ghiyasuddin. The natural scenery view from this spot is amazing experience for visitors. Hindola Mahal: The word hindola means swing and mahal means palace. This is the palace having been sloping side walls. 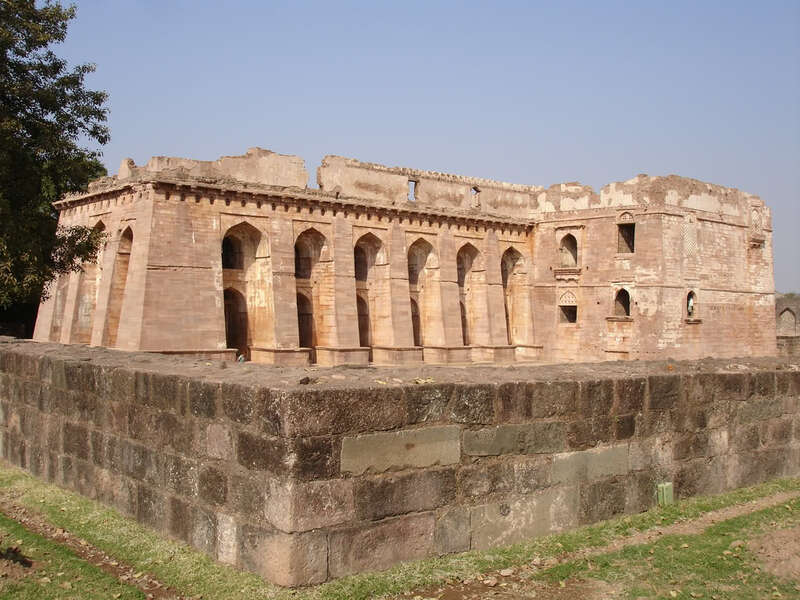 The living standard of rulers in Mandu can be judged after seeing the Hindola Mahal. This royal palace consists of the Jahaz Mahal, Tawili Mahal, Hindola Mahal, and Nahar Jharokha. 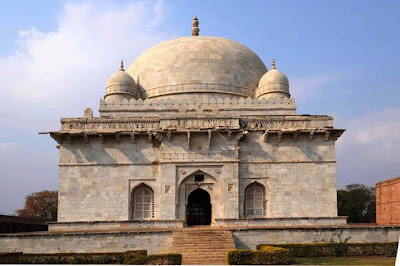 Hoshang Shah's Tomb: experts say this tomb is the first and only marble structure designed with Afghan architecture. The amazing work on walls makes it different tomb then other. Beautifully balanced dome with complex marble work enhances the beauty of Mandu. This tomb was served as the model for the structural design of Taj Mahal. Jami Masjid: the structural design of this monument is similar to the mosque of Damascus. The simplicity and structural design with big courts are amazing of Jami Masjid. 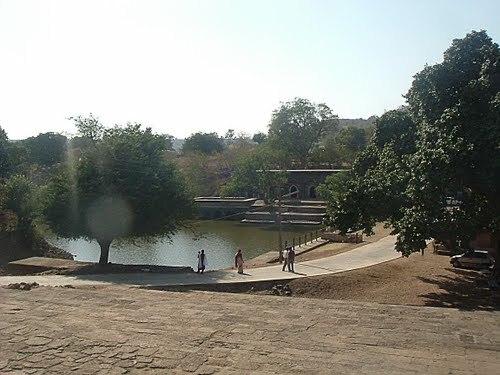 Rewa Kund: it was the reservoir used to supply drinking water to Rani Roopmati's Pavilion. It was constructed by Ruler Baz Bahadur. Roopmati's Pavilion: the huge granite designed structure was built for army surveillance so the post was known as Roopmati's Pavilion. Queen Roopmati was the wife of Ruler Baaz Bahadur. 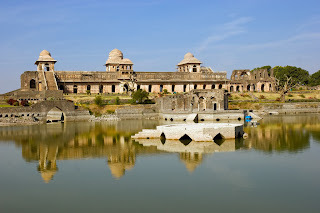 However, the palace of Baz Bahadur is constructed near the Narmada River. Baz Bahadur's Palace: this Mahal was constructed in 16th century popular for the big squares and the largest halls with huge terraces. Reaching Mandu is possible through different ways. International tourist can attain to Delhi (1100 kms), Hyderabad (1536 kms), Pune (1761 kms), Mumbai (1823 kms), and Bangalore (1977 kms). By Air: Indore Airport is the closest airbase to reach Mandu. 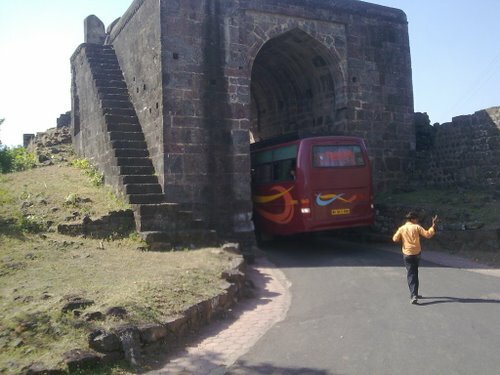 Tourist has to cover 100 kms to reach Mandu from Indore. 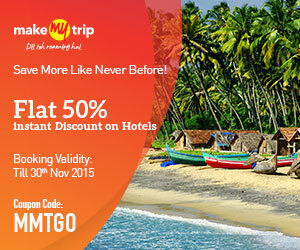 Direct flights from Delhi, Pune, Mumbai, Ranchi and Jaipur are available for Indore. By Train: closest railway station to reach Mandu is Ratlam. 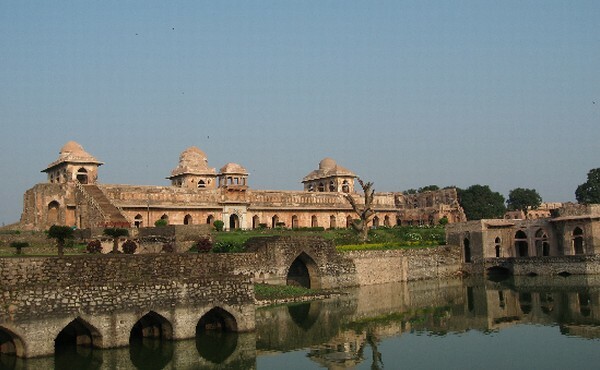 The distance between Mandu and Ratlam is approximately 125 kms. By Bus: Madhya Pradesh State tourism buses are available to reach various spots of the state. Mandu is directly connected through road, and many private transport services are offering packages to reach the destination.